Providencia and Santa Catalina are home to an unusual species that typifies these small Caribbean islands: the black land crab (Gecarcinus ruricola), which has a dark shell, red legs and an extraordinary flavor. The crabs once lived across the whole archipelago and were integral to the local diet and economy as well as to the culture of the Raizals, descendants of African slaves and British sailors. But thanks to urbanization, mass tourism, deforestation and climate change (among other reasons) this species is now under threat, with numbers declining rapidly. 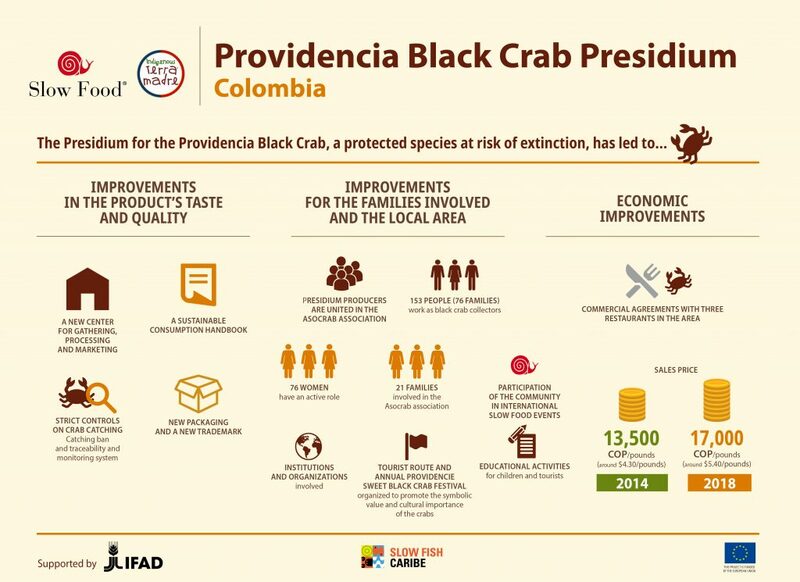 In 2014, Slow Food established the Providencia Black Crab Presidium to try to combat this decline. 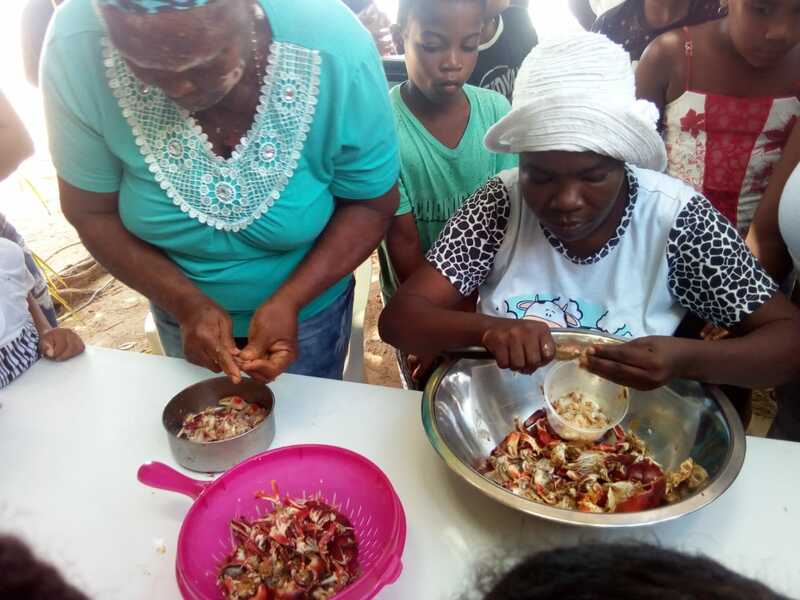 The Presidium, coordinated by the ASOCRAB association, grew out of an alliance between the Fondazione Activos Culturales Afro (ACUA), the International Fund for Agricultural Development (IFAD) and Slow Food. The project’s aim is to protect the survival of the species while promoting its cultural value, diversifying the economic activities of the crab gatherers and influencing public policy in regards to the environment and sustainability. How? By producing and marketing conserves and other products made with the crab, for example, or launching tourism services linked to the resource (such as a Providencia black crab tourist route). 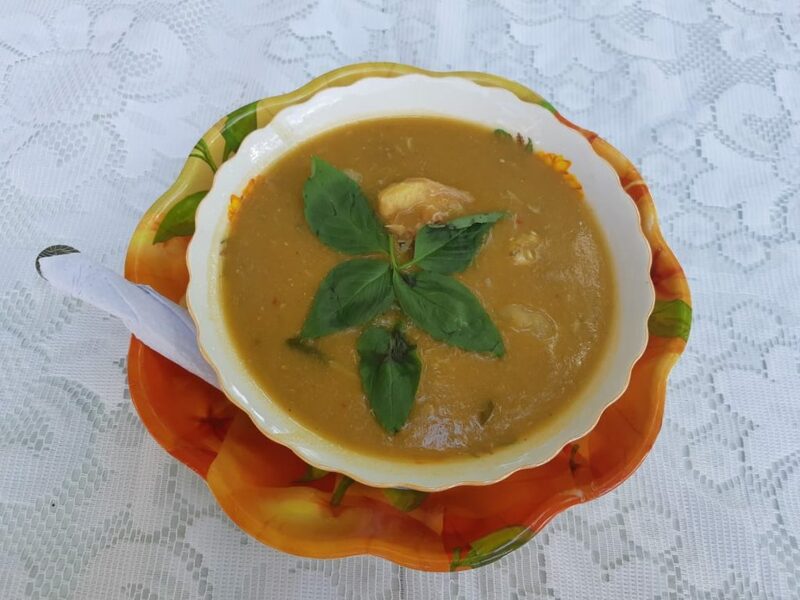 The Presidium also encourages the production, processing and consumption of other typical products from the dry forest and the sea like jumbaleen, a small fruit with a sweet-sour flavor, and the fruit of the San Andrés and Providencia breadfruit tree. We spoke with some of the women from the ASOCRAB association to learn more about the relationship they have with this resource and the archipelago’s indigenous culture. What are the main changes since the establishment of the Presidium? Thanks to the Presidium, the community has started to manage resources in a more sustainable way, but, most importantly, the organization of production, processing and sales has improved. This has strengthened the community’s positioning on the local market. Now the families that work together at ASOCRAB can used specialized facilities and small processing workshops distributed among six families. The Presidium has also worked to improve good practices to ensure the product is of high quality and correctly labeled and packaged. Our hope is that more young people can be involved. A crucial step in this regard was the launch of an entirely self-managed cultural space, the Providencia Black Crab Festival, which this year was held for the fifth time. This event unites young and old around the desire to give visibility to gastronomic practices and cultural expressions whose value needs to be recognized. The island’s inhabitants used to exploit the product indiscriminately. But in more recent years the population has developed greater awareness about the need to preserve the resource. These days, the crab harvest is subject to a seasonal ban which coincides with the reproduction and internal migration of the species, from April 1 until July 31 every year. How are the black crabs caught and how are they used in the local gastronomy? Every year, between April and June, waves of adult crabs leave the forest to travel to the sea, where the females lay their eggs. Twenty days after hatching, the baby crabs return to the forest to continue growing. The crabs are caught at night, by hand, when they come out of their hiding places to feed. They are captured alive and kept in containers, then the next day they are boiled in hot water before being processed. The black crab is typical of the local cuisine. These crustaceans are not just a source of income, but are also eaten by the families as part of their everyday diet. Every part of the crab’s body is used in the kitchen, and many believe the crabmeat is tastier than fish, lobster or shrimp, or even queen conch, another local delicacy. Traditional dishes that feature crab include crab empanadas and patties, rice ‘n’ crab, crab’s back (stuffed crab shells), boiled crab, stewed crab, crab soup, a stew called rundown and crab toe (crab claws). More recently, innovations like crab pasta and crab pizza have started to gain popularity. 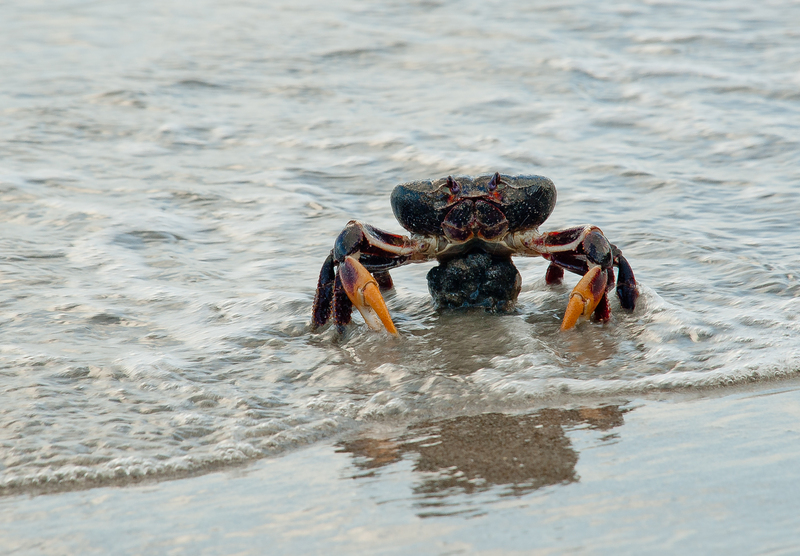 What symbolic value does the crab have? The crab is an emblem of local cultural identity and represents something very valuable to the Raizals in regards to defense, appropriation and permanence in the local area. This is closely linked to the cultural expressions deriving from the crab, like songs or myths inspired by its behavior. As an image and a symbol, the black crab can be seen in sculpture, graphic art, crafts and decorative objects. One of the most popular songs from the archipelago, by a Providencia musician called Jammin Jah, is “Mamá Cangrejo,” dedicated to mother crab. The song’s rhythm recalls the pace of the crabs during their migration, and children dance the “Dance of the Providencia Black Crab” to the music, imitating the movements and the walk of the crabs. What complementary income-generating activities do the Raizal community practice? Diversified production is the foundation of sustainability for the Providencia Island families, who must diversify in order to survive. Black crab gatherers and processers might also work in public administration or have other activities, like the informal sale of ice creams and traditional sweets, or work in fishing, tourism or farming, though the latter is rare as growing crops is very hard on the island. Why is it important for the community to promote the consumption of this product? Within the context of the archipelago’s indigenous community, the promotion of the product is very important for the survival of the Raizal culture, and it is also a tool for economic sustainability for a good part of the population. The sale of the crab meat and claws is an important source of income for Providencia, so the consumption of the resource in its various forms and the services linked to it (like the tourism routes on the island) are synonymous with greater opportunities for the Raizal families who make their living from these activities. Promoting the crab also means working on multiple fronts, starting with awareness-raising among the entire community about the importance of conserving the resource and its habitat, recognizing those who protect it, encouraging local consumption and involving the youngest generations in order to give continuity to gastronomic traditions and together better root their sense of identity. The Presidium activities are continuing thanks to the support of IFAD and the European Union, in collaboration with the Fundación Activos Culturales Afro (ACUA), the agency for the sustainable development of the San Andrés, Providencia and Santa Catalina Archipelago (Coralina) and many local members of vital strategic importance. SFYN Asia campaigning to protect biodiversity.